Psyche Williams: The author also seems unaware of the Rhodesians heroic feats, in Africa, the US and other countries of the world. She also was not aware that Disney starred a RR and that another had a split second cameo in Silence of the Lambs..that they have been in many commercials, Vogue advertisements and the heroic deed/rescue on America's Most Wanted. National Geographic profile of their ability to detect a crash with their manic depressive owners and one of my pups detected cancer with their owner and caused her to seek a doctors opinion and diagnosis. If it were not for her RR's nose the owner would have never known till it was possibly too late. Allex Michael: I was not aware of all their feats. It sounds like Rhodesians have more than their share of accomplishments. I have seen a few print adds with ridgebacks and the film Psyche refers to is the 1993 Disney production A Far Off Place, where two children, a bushman and a ridgeback brave the Kalahari desert under dire circumstances. Few references even mention the dog. I have no doubt that Psyche Williams's dogs are a ringing endorsement of the breed and if I wasn't so committed to adopting dogs from the pound, I would really like to get one of her ridgebacks when Ebbey's time comes. 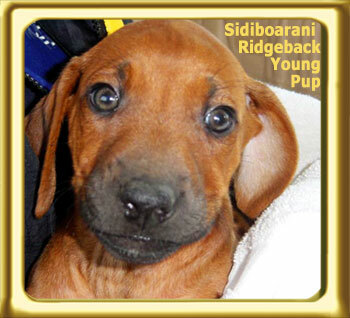 The question is are her ridgebacks exceptional or just average examples of the breed?